OutLoud!, a small ensemble comprised of select members of the Twin Cities Gay Men’s Chorus, is a force to be reckoned with in its upcoming show Forces of Nature on May 11 and 12 at the Ritz Theater. Channeling the four elements of nature (earth, air, fire, and water), these talented men will perform creative arrangements of crowd-pleasing favorites like “I Feel the Earth Move,” “Landslide,” “Ring of Fire,” “Glitter in the Air,” “Proud Mary,” and so many more. Directed by Bob Schlidt, OutLoud! 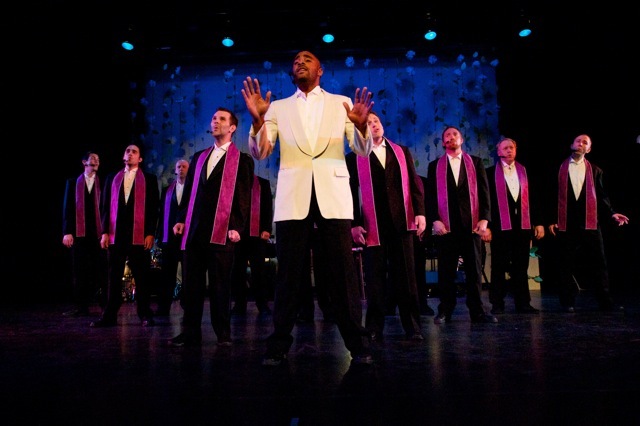 is an audition-only group formed out of the Twin Cities Gay Men’s Chorus in 1993. Current members include Dan Lekatz, Ryan Rollinson, Sean Sweeney, Scott Dutton, Rob DuBois, Josh Grant, Matt Hoppe, Erik Hamberg, Nathan Croner, Mike Stebnitz, Robbie McNamee, and Eric McCool. Forces of Nature will be performed on May 11 and 12 at 8:00pm at the Ritz Theater in Minneapolis. Tickets are priced at $29 for general admission, and guests also have the option to sit at 4-seater cabaret tables (complete with a bottle of wine or non-alcoholic alternative) for $168. For more information and to purchase tickets, contact the Ritz Theater Box Office at (612) 436-1129, or visit the website at www.ritzdolls.com. Tickets are selling quickly–don’t miss out!